This lesson on how to play lush open chords is taken from my new book First Chord Progressions For Guitar. From The Edge to Slash, Taylor Swift to Ed Sheeran, lush open chords rule the world when creating exciting rhythm guitar progressions. Although the traditional open chord voicings shown in Chapter Two are your ‘bread and butter’, the lush open chord voicings shown in this chapter will open your eyes and ears to the beautiful sounds they can create. A suspended or ‘sus’chord is one that replaces the 3rd with either the 2nd or the 4th. Instead of 1 3 5, the formula is 1 2 5, or 1 4 5. Instead of C E G, the notes are C D G, or C F G.
When the 3rd is replaced with the 2nd, the chord is named ‘sus2’. When the 3rd is replaced with the 4th, then the chord is named ‘sus4’. I love playing open chords! They have a ringing quality which is hard to match with barre chords. I find them especially useful when it is just a vocalist and myself. 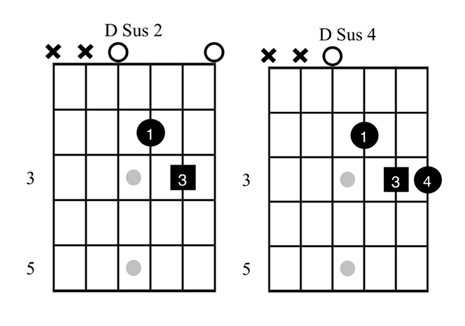 Example 6a demonstrates the two new chord voicings of Dsus2 and Dsus4. A suspended chord has an airy quality to it and can be used to replace either a major or a minor chord shape. U2’s guitarist The Edge is synonymous with playing these chord voicings with lots of reverb and delays. Strumming these chords with a syncopated rhythm that includes rests works equally well. Another common place to play open suspended chord voicings is in the key of ‘A’. Example 6c shows the Asus2 and Asus4 chord shapes. Another useful suspended chord voicing is the open Esus4 shape. 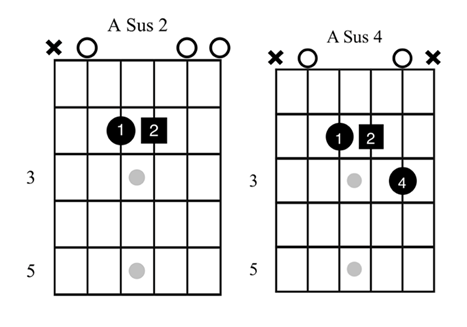 Instead of playing a traditional open A, D, and E chord progression, example 6e includes the new suspended chord voicings learnt in the previous examples. 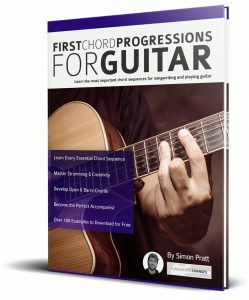 Check out my brand new book First Chord Progressions For Guitar to learn the most useful chord progressions on the guitar, quickly master creative application and theory and boost your song writing abilities.